India's Unique ID number will be tied into iris scans and fingerprints. Ostensibly the UIDAI was formed, and the idea of UID green-lighted, to help those 440 million Indian people who were found to be below the poverty level in 2002. The nation has an extensive series of social welfare programs – everything from medical support to home heating fuel subsidies – but many of these services are ripe with corruption and bureaucratic stagnation. Many of India’s poorest citizens do not have ID cards, bank accounts, or even addresses that they can use to register for social services. Often the money for these programs ends up in the hands of middle class families tricking the system by using false identification schemes. With the UID, India hopes to give every resident a means of accessing welfare services as well as cut down on fraud. To the UIDAI, the purpose of a national ID is to enable the government to get help to those who need it. Yet the UID is going to be used for much more than social welfare programs. The UIDAI is in discussions with many institutions (banks, local/state governments, etc) to allow them to use the UID as a means of identity verification. These institutions will pay the UIDAI some fee to cover costs and generate revenue. There seems to be little doubt that once it is established, the UID will become a preferred method (if not the preferred method) of identification in India. Fingerprinting for the UID will cover all digits on both hands. There, of course, will be some advantages to this. Drivers from one state will not need, nor be able to, acquire licenses from another state as their information will be universally accessible in the national database. Migrant workers, displaced poor, and refugees can all be confident that their UID identifies them no matter where they go in their country. Ultimately I wouldn’t be surprised if the UID, with its biometric data, could be used as a means of payment (when linked to a bank account), or as an access key to homes and cars. Purchase a meal with your fingerprint and unlock your door with the twinkle in your eye. Similar results could be expected in other nations that adopted biometric identification systems. To privacy advocates, however, the very concept of a national ID number is anathema. Putting all the personal information in one system opens the possibilities that it can be used for nefarious purposes – everything from identification fraud to genocide. The inclusion of biometric data such as fingerprints and iris scans increase the accuracy of such a system but also lends it an air of oppressive technologically-enabled surveillance. The UID will also include a photo of the face...but doesn't everything these days? In order to alleviate some concerns, the UIDAI has highlighted ways that the UID is less binding than it may appear on the surface. First, they emphasize that acquiring the UID is not mandated. Though, as we’ve said, the number of benefits that will be exclusively offered through the UID will make it so desirable as to be effectively mandated. The UIDAI also points out that the UID is just a number, not an ID card. 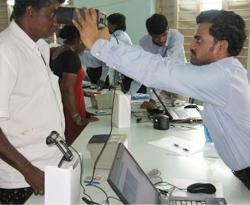 Each Indian state will still be responsible for issuing licenses and identification cards. While these cards are going to reference the UID, they may or may not contain the biometric data and other personal information gathered during UID registration. The actual UID number will not contain any intelligence; that is, it will not code for anything. It’s only a random string of digits, making it harder for hackers to exploit the system. UID’s will be given to every resident of India, no matter their citizen status. The registration process has also been made transparent. 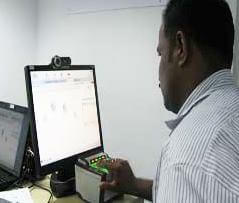 When a resident is interviewed for the UID, they can see everything that the processor does via an outwardly facing computer screen attached to their laptop. Residents provide their name, date of birth, gender, father’s UID (if applicable), mother’s UID (if applicable), and address (if applicable). Fingerprints, picture, and iris scans are collected at the same time. I understand the creepiness factor associated with a government agency registering everyone, giving them a number, and scanning their fingers and eyes. There’s some chilling Big Brother-like aspects to this whole affair. Yet the problem of insuring that resources make it to India’s poor is very real, and there’s the strong possibility that the UID will be empowering and democratizing to the 440 million Indians below the poverty level. It will take years before we know if the benefits of the UID program will outweigh the abuses it could create. 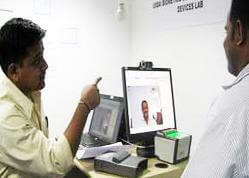 The debate on privacy and national ID continues, but in India it looks like the UIDAI is already moving towards victory.